The mobile site at kadaza.com/m is optimized for viewing on mobile devices. Just head to kadaza.com/m on your mobile browser to get Kadaza on the go, whatever device you’re using. A refreshingly fast way to browse the web on your mobile! 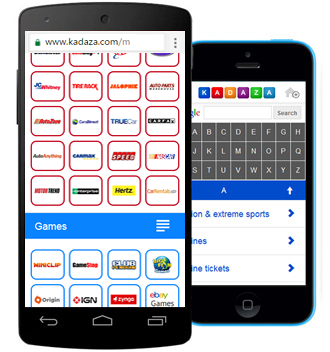 When you open up your mobile browser, you can instantly start using Kadaza. It varies by phone type how to add a Kadaza icon to your homescreen. 1. Go to kadaza.com/m in your mobile browser, like Chrome, Safari or Internet explorer. 2. Click the add icon in the upper right-hand corner and follow the instructions.